When in September 1904 Derain was discharged from his military service, he returned to Chatou, where he was living with his parents, and rented a small studio. Chatou was a small suburban town north of Paris in which Degas, Renoir and other Impressionists had been practising landscape painting. There, Derain met again Maurice de Vlaminck, whom he had known since 1901, and during the winter of 1904-1905 they went often out together to paint landscapes from nature. That winter Matisse, who was taking part in the organisation of the new Salon des Indépendants, asked them to participate in the March 1905 exhibition. It was also Matisse who, in February 1905, introduced Derain to the art dealer Vollard, who bought from the young artist all the pictures he had so far painted in Chatou. Landscape near Chatou belongs to the series of landscapes Derain executed during that winter, which marked his professional career and during which the small artistic group known a year later as the fauves was being formed. Like in other landscapes painted that winter, the artist has chosen a small hill as his viewpoint. A clump of trees in the foreground, parallel to the pictorial plane, serves as a kind of screen through which we can see several houses in the middle distance, then the river and beyond it the cultivated plain. The horizon is very high and the sky can hardly be seen. The execution is very concise and direct, anticipating what would later be one of the characteristic traits of fauvism. In this painting the palette relies essentially on cold shades, blues and greens. Unlike the purer and brighter colours found in works painted by Vlaminck and by Derain himself that winter, here the artist plays with rather subdued shades. From the two great post-Impressionist masters that Derain most admired at that time, namely Cézanne and Van Gogh, it is probably the former he had in mind on that occasion. 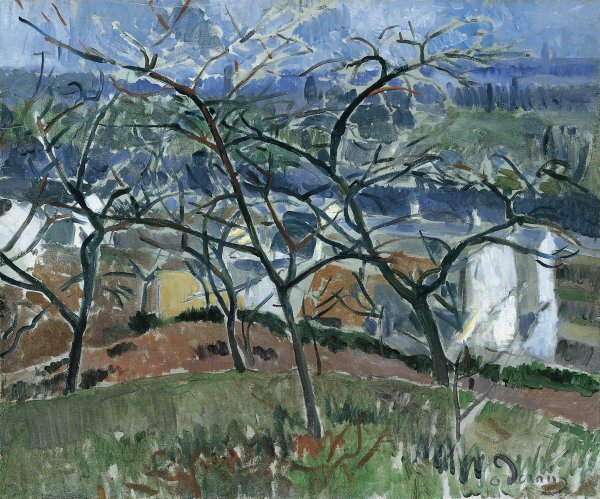 Besides Cézanne's influence, there is also a reference to the Nabis in the attempt to produce an effect of flatness and in the appearance of open cloisonné created by the lines of the naked branches that cut out the background landscape. Derain uses very often this device in his Chatou landscapes. In this sense, it is worth recalling that in the 1904 Salon d'Automne a separate room had been reserved for Cézanne, who exhibited forty-two paintings, and that in November and December the Galerie Druet had organised an important exhibition of Maurice Denis's oeuvre, showing eighty-five of his works. Landscape near Chatou illustrates the recent impact of those exhibitions on the young Derain.